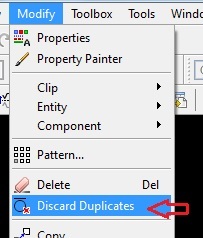 In this post we will see Discard /Delete Duplicates command in DraftSight. 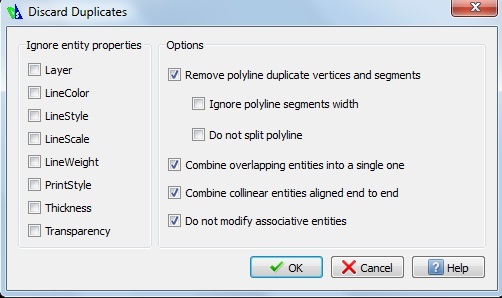 This is very useful command if you have to remove duplicate or overlapping entities inside your Drawing files. Where is this command in DraftSight ? Note: This is premium command that means it won’t work in Free version of DraftSight. Also you can Run command DISCARDDUPLICATES from command window. Suppose you have rectangle over rectangle or Circle over circle or any entity over another same entity then visibly it looks as if there is only one entity but if you window select those entities as below then you will see that there are multiple entities overlapping. So How to delete those overlapping entities without selecting one by one or moving overlapping entities and deleting it inside DraftSight ? For this run DISCARDDUPLICATES command in DraftSight . Now select overlapping Entities by window selection & Press Enter or If you have already selected those entities then run command will pop up following dialog box. With default options selected on this dialog box if you click ok then all overlapping entities will be deleted . You can check result by windows selecting those entities Right Click > Properties. However, DraftSight offers different checkbox options to Check or uncheck depend upon your criteria. Also you can ignore some entity properties from this dialog box. Try different options and let us know if it works correctly for you. This feature is time saver ! Also removing duplicate entities will reduce your file size. Also Check How to Clean Up Drawing Files in DraftSight? Share your thoughts about this command in comment section below. If you face any problem using this command the do let us know we will definitely try to solve it asap.